Habit: Annual 1--10(20) cm, generally +- gray, cobwebby to tomentose. Stem: 1, erect, or 2--10+, ascending to decumbent, +- forked, generally evenly leafy proximally, +- leafless between distal forks. Leaf: alternate, +- sessile, generally elliptic to oblanceolate, entire; distal leaves subtending heads, crowded, largest wider than proximal leaves. Inflorescence: heads disciform, +- sessile, 2--10 per dense group; involucre 0 or vestigial, simulated by paleae, or +- cup-like (then phyllaries 1--4, +- unequal, like reduced paleae); receptacle length (2.8)4--8 × width, +- cylindric to club-shaped, glabrous; paleae of pistillate flowers each generally enclosing flower, or outermost open, deciduous with fruit, +- boat-shaped, acute to obtuse, +- woolly abaxially, obscurely parallel-veined (veins 5+), margin reflexed distally or fully as scarious wing, wing terminal, erect to curved inward, visible in head; paleae of disk flowers generally 2--5, reduced, erect, +- folded, lanceolate, acute, papery, scarious, glabrous or cobwebby. Pistillate Flower: 12--25+, all subtended by paleae; corolla obscure, narrowly cylindric. Disk Flower: staminate (ovary partly developed in some species), 2--6; pappus of (0)1--10(13) free, deciduous bristles, hidden in head; corolla generally 5-lobed; anther base tailed, tip +- triangular; style tips +- linear-oblong. Fruit: each enclosed by palea, +- obovoid, variously compressed, smooth, shiny, corolla scar +- terminal, pappus 0. Species In Genus: 7 species: southwestern North America. Etymology: (Greek: column bed, for long receptacle) Note: Close to Logfia. See also Ancistrocarphus, Micropus. Habit: Plant 2--8(11) cm. Leaf: acute, mucronate, longest 6--15 mm; largest distal leaves 4--11 mm, 1--2.5 mm wide, all +- elliptic to oblanceolate, distal-most generally 0.8--1.2 × heads. Inflorescence: heads +- spheric, woolly, largest 5--6 mm diam; phyllaries 0 or <= 0.5 mm, +- awl-shaped, deciduous; receptacle 1.4--2.7 mm, 4--7 × width, cylindric; longest paleae 3.4--4.2 mm, winged distally, wing elliptic to ovate, widest in distal 1/3 of palea, palea body cartilaginous; outermost paleae +- closed. Disk Flower: corolla 1.1--2.3 mm; ovary 0--0.3 mm. Fruit: 1--1.4 mm, compressed front-to-back; disk pappus bristles (0)1--4(8), 1.1--2 mm. Unabridged Note: Perhaps derived from Stylocline micropoides × Stylocline psilocarphoides. 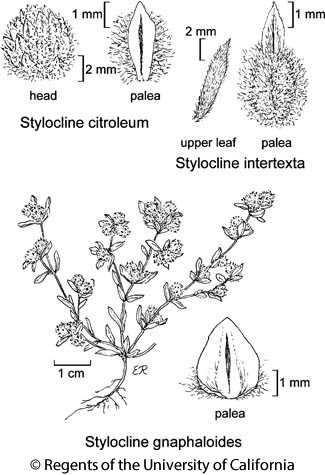 Citation for this treatment: James D. Morefield 2012, Stylocline intertexta, in Jepson Flora Project (eds.) Jepson eFlora, http://ucjeps.berkeley.edu/eflora/eflora_display.php?tid=45792, accessed on April 22, 2019.
n&e DMoj, DSon; Markers link to CCH specimen records. Yellow markers indicate records that may provide evidence for eFlora range revision or may have georeferencing or identification issues. Purple markers indicate specimens collected from a garden, greenhouse, or other non-wild location.